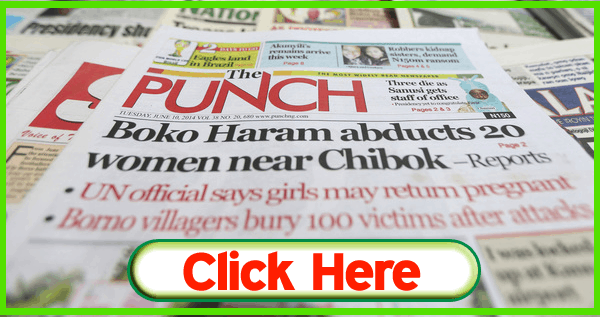 Here Are The Major Nigerian Newspaper Headlines For Saturday, 4th August, 2018. President Muhammadu Buhari is now in the United Kingdom for a 10-day vacation. Buhari who departed Abuja for London in the early hours of Friday was bidded farewell by the Inspector General of Police, Ibrahim Idris; the Minister of the FCT, Mohammed Bello and the Chief of Staff, Abba Kyari. The Economic and Financial Crimes Commission (EFCC) has launched a manhunt against senior staff of the Joint Admissions and Matriculations Board (JAMB) involved in the misappropriation of N8 billion revenue, Daily Trust reports. Sen. Abdullahi Adamu (APC-Nasarawa), has discredited the resent exit of Nigeria Senate President, Dr. Bukola Saraki from the All Progressive Congress (APC) to People Democratic Party (PDP). Adamu, who made his mind known while speaking to newsmen, said, “Saraki had stepped on banana peel and should be prepared to bear the consequences of his action. Makarfi while speaking on Friday in Lokoja at a meeting with leaders and stakeholders of the PDP in Kogi State warned against a repeat of the mistake made when the PDP was handed over to Senator Ali Modu Sheriff. Terrorist Osama Bin Laden was a good kid, but brainwashed when he entered college. The statement is from his mother, 70-year-old Alia Ghanem, in her first press interview, published in the British newspaper “The Guardian” on Friday (3).